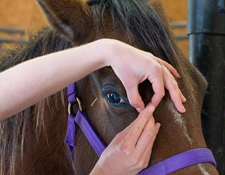 Veterinary Acupuncture is one of the branches of traditional Chinese veterinary medicine (TCVM) and has been used in China on animals for over 3,000 years. TCVM is based on the belief that there is a vital force or energy, termed Qi flowing through the body. Disease is a result of a disruption or blockage of this flow. Qi flows along channels or meridians. There are fourteen major meridians in the body. Acupuncture points are specific points along the meridians which are stimulated using sharp, very thin needles to rebalance the Qi. 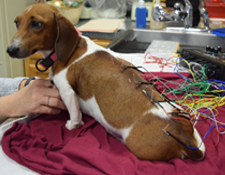 Sometimes treatments may include electroacupuncture, where an electric stimulation is applied along the needles or aquapuncture, where a liquid is injected into the acupuncture point to prolong the treatment effect. Chinese herbal medications are commonly used in addition to acupuncture to prolong and aid in the effects of the acupuncture treatment. Indications for acupuncture include: musculoskeletal problems, neurological problems, respiratory problems, cardiovascular problems, allergies, kidney problems, gastrointestinal disease, skin problems, and pain control.